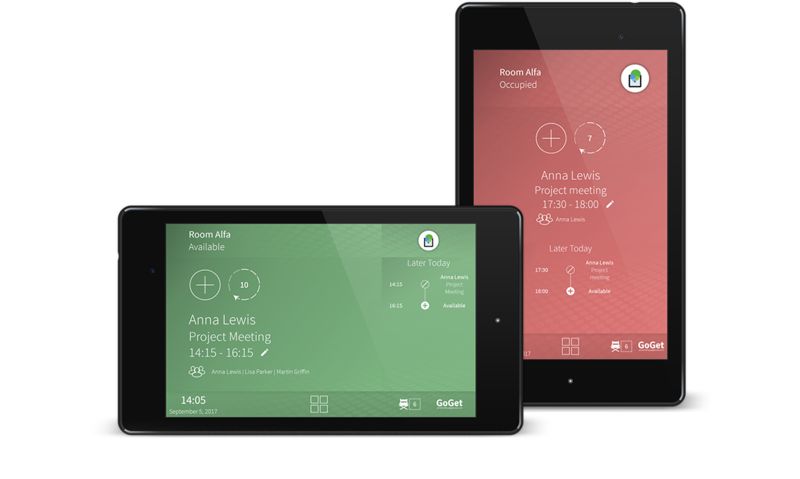 GoGet displays are available in two versions; Room Sync (7”) and Room Sync Plus LED (11.6”) and both come with Room Display 6 software, central administration and Room Analytics included. The Room Display 6 software is offered as two options; integrated in GoGet’s ready-to-use Room Sync series, or bought as license-only so you can configure the software on your own professional grade Android IPS display tablet. Contemporary design. Room Sync is an elegant touch-screen door sign for all your meeting rooms. Designed in Sweden, the sleek anodized aluminium body, combined with black glass effects and stylish wool felt accents lend an air of distinction to Swedish elegant simplicity and functionality. All at an unbeatable price. Seamless integration. Unlike many alternatives on the market, Room Sync with Room Display 6 software integrates seamlessly and effortless with most IT-policies. Notice: Room Sync MY2018 production quota is sold out and is not available for purchase (EOL). It will be replaced by a new model in Q1 2019. With the all-new 11.6-inch Room Sync Plus LED, we have produced one of the most comprehensive meeting room display systems available today – equipped with extra everything. From the inside out, this new meeting room display is equipped with some nice features that will make the day at the office a little easier and more joyful. Room Display software can fully sync with Microsoft Exchange and Google Apps, giving you and your users the flexibility to reserve rooms from any location and any device—no extra software needed! Unlike many alternatives on the market, Room Display software integrates seamlessly and effortless with most IT-policies. We believe that our customers should have the freedom whether they want to buy a complete meeting room display unit with support, or create their own software/hardware bundles. Our license-only option offers full customer flexibility for those organizations who prefer to configure a tailored solution. All-new Room Finder software for Room Display (gen 4-6) is a professional, modern and cost-efficient wayfinder solution ideal for offices with multiple meeting rooms. 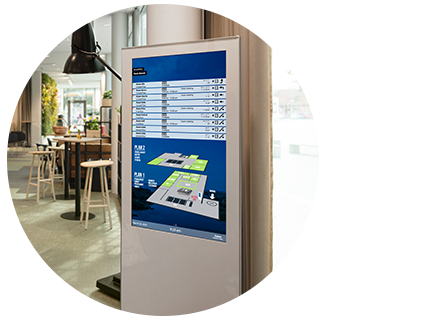 It displays easy-to-read meeting room information and directions for all visitors and meeting attendees on LED-TVs in reception areas, lobbies and other areas of the office. It enhances and supplements the GoGet Room Display system. In a workplace with multiple meeting rooms, Room Finder software provides visitors and meeting attendees with wayfinding arrows and up-to-date meeting information at a glance, including: room name, availability, meeting title and host name.